Joël van Houdt for The New York Times. Colonel Daowood, left, considered his next move on the Chak Valley road. The village was abandoned. Streets deserted. Houses empty. Behind the central mosque rose a steep escarpment. Behind the escarpment mountains upon mountains. Up there — above the timberline, among the peaks — a white Taliban flag whipped in the wind. Several Afghan soldiers were admiring it when a stunted and contorted person emerged from an alley. Dressed in rags, he waved a hennaed fist at them and wailed. Tears streamed down his face. Most of the soldiers ignored him. Some laughed uncomfortably. A few jabbed their rifles at his chest and simulated shooting. The man carried on undeterred — reproaching them in strange tongues. A truck pulled up, and Lt. Col. Mohammad Daowood, the battalion commander, stepped out. Everyone waited to see what he would do. Daowood is a man alive to his environment and adept at adjusting his behavior by severe or subtle degrees. He can transform, instantaneously, from empathetic ally to vicious disciplinarian. To be with him is to be in constant suspense over the direction of his mood. At the same time, there is a calculation to his temper. You feel it is always deliberately, never capriciously, employed. This only adds to his authority and makes it impossible to imagine him in a situation of which he is not the master. A flicker of recognition in the deranged man’s eyes suggested that he intuited this. He approached Daowood almost bashfully; only as he closed within striking range did he seem to regain his lunatic energy, emitting a low, threatening moan. We waited for Daowood to hit him. Instead, Daowood began to clap and sing. Instantly, the man’s face reorganized itself. Tearful indignation became pure, childish joy. He started to dance. This continued for a surprisingly long time. The commander clapping and singing. The deranged man lost in a kind of ecstatic, whirling performance, waving his prayer cap in the air, stamping his feet. When at last Daowood stopped, the man was his. He stood there — breathless and obsequious — waiting for what came next. Daowood mimed the motion of wrapping a turban on his head. Where are the Taliban? Eager to please, the man beamed and pointed across the valley. Several hours later, as I shared the bed of a pickup truck with an Afghan soldier who manned a machine gun mounted on the roof of the cab, it became evident that we were lost. The rest of the company was nowhere to be seen, though we could hear them, not far off, exchanging rocket and automatic-weapons fire with insurgents who had fled into the mountains and were hiding behind protective crags, shooting down. The driver sped up one narrow rutted path after another. The paths were hemmed in by rock walls — a labyrinth of cul-de-sacs — and the driver grew more panicked and reckless with each dead end. Aside from the occasional night raid, no Afghan or American forces had been to this place in more than a decade. Men stood on top of the walls, watching. “Where are we going?” I asked the machine-gunner. He offered the words I had heard time and again — so often, and so predictably, they could be the battalion motto. The words were invoked in response to such questions as: What is the plan? Who is shooting? Where will we sleep tonight? How many dead? Finally the driver stopped and asked a bearded man in a black turban for directions. The man — a Talib? — kindly pointed the way. Soon we arrived on a bare ridge and found Colonel Daowood almost alone. Two young soldiers stood nearby with rifles. Daowood sat on a rock. A teenage boy knelt before him, kowtowing, wrists cuffed behind his back. Daowood was doing something to his head. As we got closer, we saw that he held scissors and was roughly shearing the boy’s hair. A neat pile of long black locks lay on the ground between Daowood’s feet. The boy ran away, forgetting his shoes. While Daowood was giving the haircut, our driver, who it turned out was a company commander, yelled at a pair of intrepid young soldiers who had taken it upon themselves to scale the mountain and capture the Taliban’s flag. We were leaving soon, and the commander wanted them to come back down. The young soldiers, however, were too high. They couldn’t hear him. The commander yelled and yelled. If only they had radios. If only he had a radio. In lieu of one, the commander drew his sidearm, aimed in the general vicinity of the soldiers, then shot two bullets. The soldiers ducked, peered down. The commander waved. It was the third day of a four-day operation being conducted by the Afghan National Army (A.N.A.) in Chak District, Wardak Province. There were no U.S. forces in sight. Every so often, a pair of American attack helicopters circled overhead; otherwise, the Afghans — roughly 400 of them — were on their own. For the A.N.A. — which every day assumes a greater share of responsibility for the security of Afghanistan — the operation was an ambitious undertaking and a test of its ability to function independently. For years now, the U.S. military’s priority in Afghanistan has been shifting from effectively prosecuting the present war to preparing Afghans for a future one in which our role is minimal. But even as American troops return home and American bases across the country close, such a future continues to feel difficult to envision. How will the A.N.A. fare when it is truly on its own? Predictions vary, tending toward the pessimistic. To the extent that assessments of the competency and preparedness of the A.N.A. take into consideration on-the-ground observations, however, they are usually limited to the perspective of American forces working in concert with Afghan units. After a week with Daowood’s battalion, what I found is that the A.N.A. looks very different when there are no Americans around. The American side of Dash-e Towp is separated from the Afghan side by a tall wall and a door that can be opened only with a code to which the Afghans do not have access. Whereas a close partnership between coalition and Afghan forces was for years considered a cornerstone of the overall military strategy (shohna ba shohna — shoulder to shoulder — went the ubiquitous NATO slogan), recently the Americans have distanced and even sequestered themselves from their erstwhile comrades. The about-face is a response to a rash of insider or “green on blue” attacks that killed more than 60 foreign troops in 2012 (and wounded 94), accounting for 22 percent of all coalition combat deaths. The Americans claim that many of the killings result from cultural differences; the Taliban claim to have infiltrated the security forces; the Afghan government claims “foreign spy agencies” are to blame. Whatever their provenance, the attacks have eroded trust to such a degree that NATO has begun designating some personnel as “guardian angels.” It is the guardian angel’s job to protect the NATO soldier from the Afghan soldier whom it is the NATO soldier’s job to train. Other concerns abound. When the time comes, for instance, will Afghanistan’s army be able to maintain its own equipment and facilities? Evacuate and treat its own casualties? Overcome ethnic divisions within its ranks? Furnish its units with essential rations like food and fuel? Retain sufficient numbers despite alarmingly high attrition rates? Implement a uniform training doctrine despite alarmingly low literacy rates? Today, according to the Pentagon, exactly one Afghan brigade is capable of operating without any help from the coalition. For better or worse, come Dec. 31, 2014, the other 22 will likely have to do the same. In anticipation of this reality, the A.N.A. has begun a countrywide realignment of troops that is transforming the battlefield. “Look at the situation,” Gen. Sher Mohamad Karimi, the chief of army staff, told me recently in Kabul. “One hundred and forty thousand international troops, with all the power that they have — the aircraft, the artillery, the tanks, the support — all of that now is going. You cannot expect the Afghan Army to do exactly what the international troops were doing.” As coalition forces diminish, that is, the A.N.A. must decide not only how to fill the gaps but also which gaps to forgo filling. For years, to secure roads and rural areas, Afghan soldiers have manned hundreds of check posts throughout the provinces. Now the A.N.A. plans to relinquish almost all of these in favor of consolidating its forces in significantly fewer locations. General Karimi claims there are two reasons for doing this. First: the Afghans simply lack the wherewithal to keep the more remote posts adequately provisioned. Second: the A.N.A. must move away from defending static positions, toward executing offensive operations. Theoretically, the police will take over check posts as the army quits them. But this will not always be the case; it may seldom be the case. And when vacated posts are not assumed by the police — as has happened in Wardak — it will be hard not to see the ongoing “realignment of troops” as anything other than an old-fashioned retreat. Chak was one of the first districts in Afghanistan to undergo this change. When Daowood’s battalion woke around 3 a.m. and headed out from Dash-e Towp, the convoy included several large flatbed trailers hauling backhoes and bulldozers that would be used to destroy five of the six A.N.A. check posts in the area. (The last time abandoned posts were left standing in Wardak Province, the Taliban moved into them.) The sun was just starting to rise when the battalion arrived at the first one: a compact fortress of gravel-filled Hesco barriers perched on a squat hill that overlooked the entrance to the district. It was easy to see, from here, why the Taliban liked Chak. Parallel ranges form a wide valley with a river snaking down its middle. Apple orchards and trees with white trunks and bright yellow leaves crowd the basin. Dark canyons branch into the mountains. A single road follows the river deeper into the valley, connecting the lawless foothills of the Hindu Kush to Highway 1, a critical transit route that bridges Kabul and Kandahar, northern and southern Afghanistan. When C-4 explosive was packed around the bomb and exploded from what was deemed a safe remove, the blast proved much larger than anyone expected. Dirt rained down on those of us who were crouched behind a tree 100 meters away. The crater rendered the road impassable, obliging the Afghans to spend the next half-hour filling it with stones. By the time we started moving again, the minesweepers had begun working on another bomb just around the bend. I found the skinny, bearded soldier standing to the side with his pickax lightly balanced on his shoulder, smoking an immense joint. His name was Shafiullah. He wore a pair of blue latex medical gloves and a metal helmet several sizes too big that sat low and loose over wide, wild eyes: preternaturally alert eyes bugging from their sockets as if to get a little closer to whatever they were looking at. “Did you see that last one?” Shafiullah wanted to know. He nodded rapidly, the helmet bucking forward and backward on his head, now threatening to fly off, now jerked into place by its leather chinstrap. “Very big! Very nice!” He took another toke, held the doobie upright and became suddenly, deeply engrossed in its glowing tip. “What are the gloves for?” I asked. Shafiullah told me he joined the army about five years ago, when he turned 18. He served for three years as a regular infantry soldier in the violent Pakistani border regions before volunteering to become an explosive-ordnance-disposal technician. “I always wanted to be one,” he said. “I love when someone calls me an engineer.” About a year ago, after graduating from a six-month training program taught by French and American soldiers, Shafiullah was deployed to Wardak. Since then, he estimated, he had disposed of roughly 50 bombs. “Thanks to God I’ve never been hurt,” he said. I asked if any of the other engineers were less fortunate. Shafiullah said that he belonged to a team of 20 technicians and that during the past three months two were killed and eight badly injured. He also said that nine of his friends from the training course were now dead or maimed. Back on the road, one of the minesweepers called for the pickax. Shafiullah took a last drag before joining them. A few minutes later, the valley echoed with a tremendous boom. The shooting started soon after: rifles, machine guns, rocket-propelled grenades. It was too far ahead to see exactly what was happening. Later I learned that a group of insurgents ambushed the lead element in the convoy, strafing a narrow stretch in the road from within a dense stand of trees. The soldiers responded forcefully — with more and bigger weapons — killing six people in the village where the attack originated. A little while later, not far from the first shootout, there was another. This time an Afghan soldier fired a rocket-propelled grenade at a group of gunmen, killing seven. According to the soldiers, all the dead were Taliban. By the time I reached the site with Colonel Daowood, the convoy had already moved on, resuming its lurching penetration of the valley. Perhaps not coincidentally, the ambushes occurred near a small gas station that was the target of an American airstrike the night before. The owner of the gas station — a Taliban leader named Gulam Ali, who Daowood said commanded several hundred insurgents in Chak — was killed by a missile. Two old fuel pumps still stood out front, but the row of shops behind them was ruined: windows shattered, charred metal bars curled back like the melted tines of a plastic fork. Each shop offered its own little diorama of destruction. Hundreds of pill bottles scattered on a pharmacy floor; emptied shelves hanging vertically in a general store; an iron and a sewing machine standing improbably upright on a tailor’s wooden table, among burned and tattered rolls of cloth. As with Daowood’s occasional flights of rage, it was tough to tell just how much of this was theater and how much true belief. My sense was that Daowood was genuinely conflicted: a committed soldier who spent 10 years of his life in the service of a government he was profoundly disenchanted with. And he wasn’t alone. Most soldiers I spoke to conspicuously avoided expressing any fondness for — much less allegiance to — their government. Of course, this is the same with other soldiers in other armies (imagine a U.S. Marine explaining his compulsion to enlist by citing a feeling of fidelity to the Bush or Obama administrations), but the nascency of the Islamic Republic of Afghanistan makes its political leadership and national character uniquely synonymous. Put another way, in a government that has had only one president, you can’t distinguish between corrupt individuals and a broken system. All of which raises the question: In such a country, how can you be both a detractor and a patriot, as Daowood and some of his men seemed clearly to be? The Marine ostensibly fights on behalf of American principles and institutions that transcend elected officials; on behalf of what did the colonel and these soldiers fight? Most of them, when I asked, answered with the word “watan,” or “homeland.” But what does the notion of a homeland mean for someone who has seen his ruled by monarchists, dictators, communists, mujahedeen, Islamic fundamentalists and Karzai? When it grew dark, we occupied a half-built mud house on the outskirts of a small mountain village, and Colonel Daowood told us his story. The owner of the property had killed a chicken and prepared for us a large pot of soup. Daowood and his entourage huddled around the iridescent mantles of a kerosene lamp, passing the ladle around, hugging their wool field blankets against a near-freezing night. Daowood’s military career began three decades ago, when he fought the Russians in the tall mountains and narrow valleys of his native Paghman District. After the Soviet-backed government collapsed in 1992, rival mujahedeen groups turned viciously upon one another. While Kabul became the epicenter of a ferocious civil war, Paghman, just 20 minutes west of the city, remained relatively peaceful. Daowood stayed home, preferring not to enter a fray that was decimating the capital and its residents, with no end in sight. But in 1996, when the Taliban entered Kabul and ejected with unexpected ease each of its warring factions, Daowood took his wife and children to Panjshir Valley, an anti-Taliban stronghold where the warlord Ahmed Shah Massoud had retreated in preparation for a longer, harder fight. Although Massoud and his men were Tajiks and Daowood was a Pashtun (the ethnicity of the Taliban) — and although the recent civil war inflamed ethnic animosities — Daowood was received with open arms. Massoud gave his family a house and put Daowood in charge of 100 men. More war followed for Daowood. Years of land mines and rockets, ambushes and close calls. Years of night operations in the orchards of the vast Shomali Plain — a verdant land between Panjshir and Kabul. Years, finally, of much spilled blood but little ground lost or gained. And then came the year everything changed. When Daowood talks about that time — after he and his comrades routed the Taliban with the help of American air power and special operators — he grins the way you might at a memory of your naïver self. It’s the optimism of those days that both embarrasses and saddens him, the feeling that Afghanistan had been born anew. Whatever power-jockeying and cronyism afflicted the fledgling military, the civilian government under President Karzai was looking even worse. After two years, weary and bitter, Daowood resigned. “It was the corruption,” he explained. “It ruined everything. Everything was destroyed.” While Daowood embraced a new life back in Paghman — managing his family’s land and enjoying the company of his wife and sons — a resurgent Taliban began to exploit a growing disillusionment with the government and a meager deployment of security forces outside the capital. By 2006, there was no denying it: The insurgency had evolved from a lingering nuisance to a legitimate threat. One day, an old friend from Panjshir, who was serving as a corps commander in the A.N.A., visited Daowood at his farm in Paghman. “We argued a lot,” Daowood recalled. “I didn’t want to be in the army anymore. I didn’t want to fight for this government. When I explained this to him, my friend told me: ‘If good men don’t participate, the criminals will take over. We have to reclaim this country from them.’ ” In the end, Daowood was convinced. Once more he left Paghman. Once more he took up arms. The next morning, some soldiers found a Taliban flag and brought it to Daowood. It wasn’t much: Arabic script scrawled in blue ballpoint pen on a square of white bedsheet tied with twine to a stick. Daowood slashed it with his knife and tried setting it on fire. The cloth was slow to catch. While the soldiers fussed with cardboard and kindling, Daowood received a call from the American advisers at Dash-e Towp. They wanted to remind him to begin tearing down the check posts. Daowood was incredulous; he still couldn’t believe it. “What nonsense is this?” he said when he hung up. “Do they want to hand Afghanistan to the Taliban?” The other soldiers looked just as galled. They sullenly watched the flag absorb a green lick of flame, shrivel and burn. “After these check posts are destroyed, we won’t be able to enter this valley,” Daowood said. All the Afghans in Wardak, it seemed, shared Daowood’s contempt for the decision to close the check posts. When I met with Wardak’s provincial governor, Abdul Majid Khogyani, in Kabul, he told me: “I was a strong opponent of this idea. The police commander of Wardak and the National Directorate of Security chief were also against it. We know this will not work. The result of this strategy is that the Taliban have become stronger. Without the check posts, the Taliban will easily penetrate these areas. And once that happens, it is very difficult to clear them out again.” Majid was convinced that the realignment of troops had been forced on the A.N.A. command by NATO — a suspicion held by many Afghan officers I spoke to. “The local population are asking why NATO would deliberately provide the Taliban with such an opportunity,” the governor said. NATO has declined to comment on its involvement. In Chak Valley, only one A.N.A. position would remain — the most distant outpost from the highway, manned by a contingent of roughly 100. That afternoon, when the convoy reached this last outpost, a fresh company relieved the bedraggled-looking men who had been stationed there for the past 12 months, collaborating with a U.S. Special Forces team, struggling to gain a foothold. Every one of them painted a similarly bleak picture of near-daily fighting against a more numerous guerrilla army. Mile after mile of mountains and forest was owned wholly by the insurgents. Out in that big wilderness, there was even a Taliban weapons bazaar, where insurgent fighters bought and sold Kalashnikovs and rockets and machine guns and grenades. The question hovered like a bad smell: How would the Afghan soldiers who remained deep in Chak survive (or perhaps more accurately: What would they be able to accomplish beyond merely surviving?) once every check post between them and Highway 1 was razed? Severing entirely their already embattled position from the foot of the valley would be simple enough. After all, there was only one way in and out. As if to highlight this uncomfortable fact, a local informant called Daowood as soon as the convoy started to make its way back in the direction from which it had come. A number of bombs, the informant warned, were buried somewhere up ahead. Shafiullah and his team headed to the front, and the procession of Humvees and trucks slowed to a crawl. Right away, the engineers found a copper wire attached to a massive I.E.D. buried two feet underground. A few minutes later, they found another. And then another. As soon as Shafiullah blew up the third bomb, Colonel Daowood’s informant called back to say that there were probably “many more,” though he was uncertain where. By now it was dark, and we still had miles to travel before reaching the relative security of an open area nearer the highway, where the battalion was supposed to bed down. Fifty feet or so ahead of the lead vehicle Shafiullah knelt in the dim beams of the headlights scratching at the dirt with his pickax. After a while there was some hollering and a disorderly hustle toward the rear. The explosion that followed was so powerful that bits of earth lashed our backs in a warm wave. No one was hurt, and the convoy started forward again. Then it stopped again. While Shafiullah went back to work, I joined a group of soldiers sitting on the remains of an old Soviet tank. Someone produced a joint. The mood was jolly. It turned out the soldiers belonged to the company stationed since last winter at the remotest outpost in Chak. They were glad to be rotating out — even if it meant swapping one deadly place for another. Most of them were Pashtuns from eastern Afghanistan who served for many years and had wives and children to whom they sent their salaries and saw once every several months. The soldiers hoped to get some leave when they returned to Dash-e Towp — but visiting home, they said, was a mission in itself. Stretches of the highway between Dash-e Towp and Kabul were treacherous; many soldiers had been abducted and murdered by insurgents on their way to see their families. In the past you could dress in the traditionalshalwar kameez, hire a taxi and pose as a civilian. But now the Taliban had spies who alerted them when soldiers headed out. The only option was to catch a ride on a convoy, and those could be rare. Recently, the soldiers said, one of their lieutenants lost his infant son to an illness: though he was from Kapisa Province — a short drive north by car — it took him 20 days to get back. Eventually Shafiullah found and detonated the fourth bomb, and the soldiers on the tank — high as kites by then — returned to the road and continued on. It was 1 in the morning by the time they reached their destination. On the way, they had to stop again and again for Shafiullah’s team to excavate and blow up I.E.D.’s — 11 in total. At some point after midnight the engineers got sloppy, igniting the C-4 on one bomb before Shafiullah could escape the blast radius. The pressure wave collapsed a mud-brick wall he was walking by, crushing his ankle. When I saw Shafiullah the next morning, his pant leg was in tatters and he was limping. His leg looked badly swollen. He hadn’t seen a medic yet and didn’t plan to. This was the day that Daowood brought his men up the mountain to a village called Ali Shah and found it deserted except for the deranged man who danced for him. 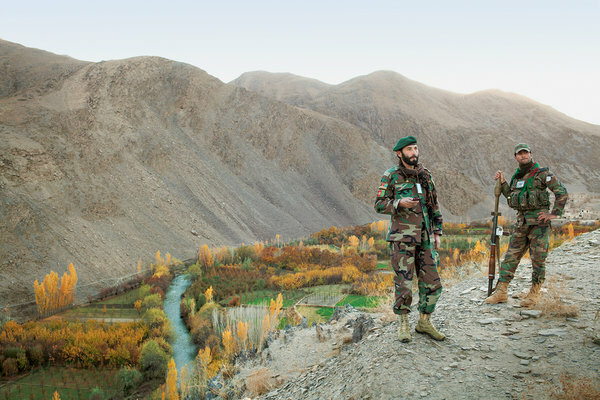 Among the Afghan soldiers, Ali Shah was infamous — an insurgent sanctuary where no government forces had dared to venture in more than a decade. (“Even the women are Taliban!” one sergeant told me.) Daowood had received intelligence that there would be a wedding in the village that day with several insurgent commanders in attendance. He said he wanted to pace the operation to crash the wedding in time for lunch. When Daowood asked where the Taliban went, the deranged man pointed to a distant hillside where a large group of villagers had gathered outside a mosque. Daowood and his men jumped in their trucks and headed that way. I rode in the back of a Toyota pickup with a middle-aged machine-gunner named Fazil. It turned out that Fazil was the lieutenant the soldiers on the tank had mentioned the night before — the one who had been unable to get home in time for his son’s burial. As we talked, there was something deeply familiar about the way Fazil described his village in Kapisa Province. He might have been a U.S. Marine reminiscing about the family ranch in Texas. The river was wide and clear, bountiful with fish. The people were kind; the air was fresh; the fruit was sweet. Fazil’s education in the peculiarities of war began when he was 12, during the jihad. One day, while he was with his father and uncle at the local bazaar, a foot patrol of Russian commandos — or Russian soldiers who Fazil assumed were commandos because of the ski masks they were wearing — opened fire on the villagers. Fazil’s uncle bled out and died on the ground in front of him; Fazil’s father also took a bullet but survived. Several years later, a jet from the Soviet-backed government launched a missile at Fazil’s home that killed both of his parents; shortly thereafter, Fazil joined the mujahedeen in Panjshir led by Massoud. During a battle with Soviet fighters, Fazil was shot in the leg and had to be taken to a hospital in Kabul. There the government asked him to switch sides. Fazil agreed and for a year fought for the national army against his former comrades. When I asked how he could volunteer for the same force that killed his parents, Fazil said: “The mujahedeen knew I was with the government the whole time. I was giving them information.” After the government collapsed, Fazil went back to Panjshir and rejoined with Massoud. This capacity for switching sides, betraying sides, playing sides, often simultaneously, always baffled the foreign forces in Afghanistan. The complex logic of Afghanistan’s ever-shifting allegiances is simply inscrutable to most outsiders; we have never really understood whom we’re fighting or why they’re fighting us. I once went on a mission in a volatile eastern province with a platoon of American soldiers and a member of the U.S. Army’s Human Terrain System — a historian with a doctorate and an assault rifle whose job it was to map which anti-Soviet mujahedeen groups the elders in the area identified with. Some Afghan troops were there as well, and I remember the mystified looks on their faces as this soldier-professor grilled (through an interpreter) one graybeard after another about the commanders they fought under 20 years ago. It was a joke, of course — one that mostly made fun of the Americans. A few years ago, the coalition embarked on an ambitious enterprise to record in an electronic database the biometric information of hundreds of thousands of Afghan citizens, and a hallmark of American patrols has subsequently been the lining up of villagers to digitally register their eyes and fingerprints. Daowood’s faux iris scan was in part an acknowledgment of the A.N.A.’s inferior technology. But it was also a dig at the coalition’s somewhat desperate reliance on technology. Where Daowood’s interactions with villagers were always intimate, it is hard to imagine a more clinical and alienating dynamic between two people than that of the NATO service member aiming his Hand-held Interagency Identity Detection Equipment at the face of a rural Afghan farmer. In such moments, the difference in the field between the U.S. and Afghan soldier is far starker than that of the foreigner and the native. It is more akin to the difference in the ocean between a scuba diver and a fish. For example: it never occurred to me that Daowood was being entirely serious when he said he wanted to arrive at the wedding in time for lunch. But as soon as we reached the gathering on the hillside in Ali Shah, we were invited into a house and served generous plates of stewed lamb and rice. Daowood dutifully commenced his anti-establishment diatribe, telling me, in a voice loud enough for everyone to hear: “These are good people, all of them. If the government worked for them, if the government helped them, they wouldn’t fight us. The government officials should come to places like this. They know nothing of the people’s lives outside of Kabul.” When one villager added that “the ministers put all the money in their own accounts, they build themselves nice houses and buy nice cars,” Daowood nodded in sympathetic agreement. Just outside, meanwhile, some soldiers standing guard discovered a canvas sack full of rocket-propelled grenades stashed behind a boulder. A group of men were spotted fleeing into the mountains, and the day’s fighting began. “Just stay inside,” Daowood told him. And for the most part — even if not exactly lionlike — the soldiers got up and pushed on. It’s too early to tell what the Afghan National Army will look like on Dec. 31, 2014. No doubt its level of readiness for the uncertain future will vary hugely from region to region, unit to unit. But it is a mistake to dismiss or disparage the Afghan soldier, as is often done by foreigners in Afghanistan. After the ambush (three insurgents were injured; no soldiers), I walked toward the highway, which we could see through the bare trees at the foot of the valley, alongside a young medic from Daykundi Province named Abdul Karim. Like most of the people from Daykundi, Karim was Hazara, one of Afghanistan’s ethnic minorities. Because they follow the Shia branch of Islam, and because their distinct facial features make them easily recognizable, Hazaras are uniquely vulnerable to militant Sunni fundamentalists. In Afghanistan, this has certainly been true with the Taliban, who, during their rise to power, massacred Hazaras by the thousands. “For my people,” Karim told me, “it is important to serve in this army.” Almost all of the men in his family, he said, enlisted as soon as they were old enough. Twenty-eight of Karim’s brothers and cousins wore the uniform. Almost as soon as we got back to Dash-e Towp, I overheard some U.S. officers loudly complaining about the inability of Afghan soldiers to make appointments on time. Afghan soldiers do have difficulty making appointments on time, it’s true. They also don’t like to stand in straight lines or dress according to regulation or march in step or do so many of the things intrinsic to a Western notion of professional soldiering. When a lieutenant calls a formation of Afghan privates to attention, they will inevitably resemble, as my drill sergeant used to say, “a soup sandwich.” But they will also accept a much higher level of risk than any coalition force ever has. Their ranks are filled with tough and brave men who run toward the fight without body armor or helmets or armored vehicles and sleep on the frozen ground without sleeping bags and dig up I.E.D.’s with a pickax and often go hungry and seldom complain. It was dark by the time Daowood returned to the base; he wanted to be the last man in. When I visited him in his room, he was sitting on the floor, drinking tea. A small TV played quietly in the corner, and as we talked I heard a broadcaster mention the news: yesterday, Barack Obama was re-elected president. I pointed this out to Daowood, who wasn’t much interested. “They’re all the same to us,” he said. Then, seeing I was taking notes, he added, “We just want someone who will help Afghanistan.” But the colonel seemed to know that in the end that job would be his. Luke Mogelson is a contributing writer for the magazine and a co-editor of Razistan.org. He last wrote about a lawless Afghanistan border town. A version of this article appeared in print on January 20, 2013, on page MM28 of the Sunday Magazine with the headline: Which Way Did the Taliban Go?.